Data has become a driving force behind measuring the success of various sectors of society. Both the public and private sectors rely on measurable indicators to support claims of successes or failures. In a recent blog about the private sector’s role in achieving the SDGs, I discussed the need for meaningful reporting by way of key performance indicators (KPIs). Measuring impact should become more commonplace to ensure transparency and clarity when discussing impact related businesses. Why should impact be measured? When impact and KPIs are joined, measuring impact proves to investors that the business is succeeding in its mission. That is to say that investors are made aware of exactly what their money achieves and can thus have a tangible number of how many individuals are impacted or how many tonnes of materials recycled, for example. The world of impact is broad, and there are a multitude of forms impact can take. 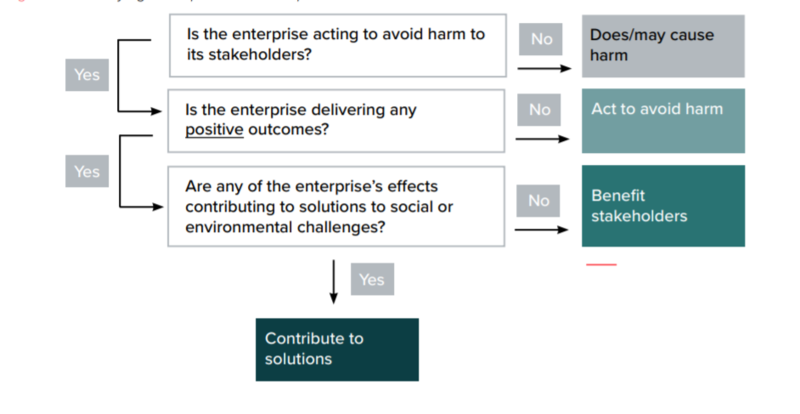 In a recent guide published by Impact Management Project, they give helpful advice on how to classify a given enterprise’s impact as either “act to avoid harm”, “benefits stakeholders” or “contributes to solutions”. Not all impact is positive nor the same. The word tends to connote positive change, but enterprises can certainly bring about negative impact on the greater society. Any business that generates some societal impact certainly plays an important role. Nevertheless, the most amount of positive effect is had with enterprises that contribute to solutions. The better one is able to identify the level of impact a business strives to achieve, the more accurately the amount of impact can be measured. There are a multitude of measures and methods for measuring impact, and a lot depends on the enterprise being assessed. That said, there are categories that are important to consider when measuring impact. In the same guide by Impact Management Project, there are 5 categories that provide a comprehensive look at how ‘impactful’ an enterprise truly is. Of particular interest are the fourth and fifth categories, which look at what would likely happen and how the enterprise builds upon natural occurrences and the risk associated if things do not go according to plan. By taking these two ideas into account, enterprises are better equipped to not only generate more positive impact, but be able to defend why their business is an essential aspect in generating positive social impact. The subject of measuring impact is vast. More conversation about measuring impact must be had to ensure that clear performance indicators are being set. Impact related KPIs have the possibility of changing the way impact is viewed, making measurable positive change.